Small details like handy wicker storage baskets and the distressed wood finish that begs to be touched helps this end table stand apart from the rest.The one drawer and two removable wicker baskets are perfect for helping get living room clutter under control. 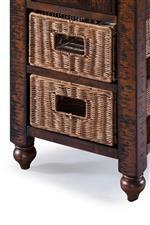 The Cottage Lane Casual Chair Side End Table with Removable Storage Baskets by Magnussen Home at Beck's Furniture in the Sacramento, Rancho Cordova, Roseville, California area. Product availability may vary. Contact us for the most current availability on this product.